The building firm is working with South Lanarkshire Council to deliver 30 affordable homes on a site adjacent to the primary school. As a direct result of these works, which are set for completion this spring, CCG has donated £1,500 to the school which will go towards the purchase of resuscitation manikins for the teaching of CPR to pupils, staff, parents and grandparents. 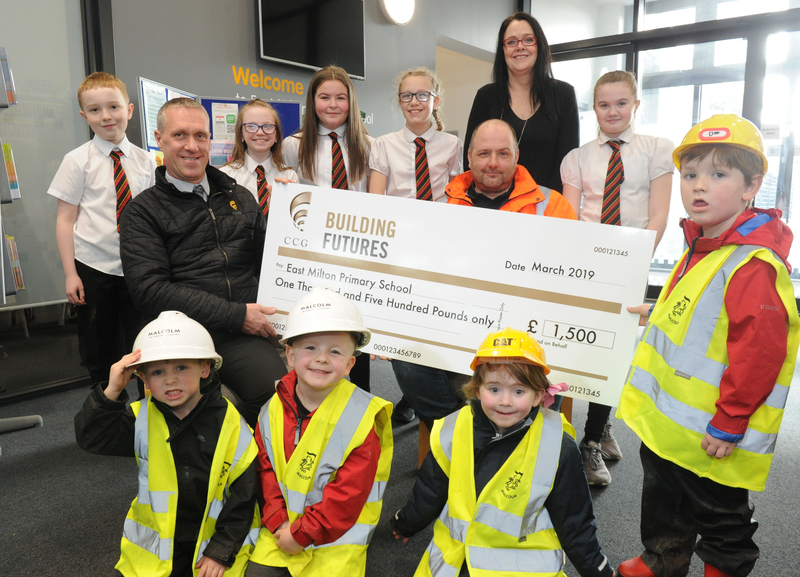 The donation forms part of CCG’s wider community benefit initiative for the area which has seen two full-time jobs, two trade apprenticeships and three work placements created whilst curriculum support was provided to pupils of the primary school and local colleges. Contracts manager for the project, Tom Tracy, was on hand to present the cheque to Mrs Callaghan and school pupils. CCG is also working on a further project with South Lanarkshire Council to deliver 18 affordable homes in Carluke as the council progresses with its Homes+ programme that aims to provide 1000 additional council homes across South Lanarkshire by 2021. Both organisations, alongside hub South West, are also set to embark on a major 330-unit mixed-tenure residential development in Cambuslang later this year. Seven Hills Business Park in Sighthill, to the west of Edinburgh, has been sold to UBS Asset Management’s (UBS-AM) Real Estate & Private Markets (REPM)’s Triton Property Fund LP (Triton) by way of a forward commitment for an expected total consideration of circa £15 million. Previously owned by Peveril Securities in a joint venture with Citivale, Seven Hills is regarded as one of Edinburgh’s principal industrial locations. Construction work recently started on building 76,000 sq ft of industrial and trade space which is due for completion in autumn of this year. Already home to Napier University and Amazon, eleven units, ranging from 3,360 to 14,700 sq ft are being built at the 5.5 acre Seven Hills, which is in close proximity to Edinburgh and the wider road network. Three of the largest units will have first floor office accommodation and all will be located within a secure site with a communal yard. Seven Hills is being marketed by joint letting agents Ryden, Burns & Shaw and Montagu Evans. Lynne O’Rourke from regeneration specialist ENGIE has been shortlisted for one of the sector’s most sought-after awards, the ASCP Women in Safety and Compliance category 2019. The ASCP Safety & Compliance Awards reward those outstanding individuals and organisations who go the extra mile to ensure safe and compliant working practices to safeguard tenants, staff and property, finding new or innovative ways to improve living environments and communities. Lynne, a thirty two year old Gas Plumbing Administrator from Beith, North Ayrshire was shortlisted for going the extra mile during Gas Safety Week. She developed a range of promotional material for ENGIE’s internal use and compliance as well as specific promotional materials for a number of clients and supply chain partners. She implemented daily themes covering all aspects of safety and compliance while working hard to inspire the next generation of women operating in the sector. Held on the evening of April 24 at the Celtic Manor Resort, Newport, the ASCP Safety & Compliance Awards have become a highlight in the industry calendar. Now in its 7th year, the spectacular black-tie event will once again welcome over 500 guests and finalists to an evening of networking and celebrating, accompanied by an excellent three-course meal and top-class comedic entertainment. A £170,000 project to improve the cycling and walking network in Braehead and Broomridge is underway. Stirling Council successfully secured funding from the Scottish Government, through Sustrans Scotland’s Community Links programme to fund the initiative which will see paths widened, the construction of new crossing facilities and dropped kerbs. New signage will also be installed to make the route into the city centre clearer for cyclists and pedestrians. The works are expected to last seven weeks, having started on February 25. The project forms part of Stirling Council’s Active Travel Action Plan (ATAP), which supports the delivery of the Local Transport Strategy (LTS) by encouraging and enabling more trips to be made by walking, cycling and public transport. Construction and property consultancy Thomas & Adamson has sealed a sponsorship deal with Literally@Newbattle in support of the Festival of Words. The festival, taking place 26-27 April, is a joint venture between Newbattle Abbey College, Midlothian Council, Queen Margaret University and local writers’ groups, and will focus on engaging with children, young people and families living in Midlothian through a two-day diverse programme. It will be the first time the local authority will host its own literary festival. The festival will feature a number of events which reach beyond the ‘typical’ literary festival and directly engage with people who are underrepresented in the literature and literary art sector.